1 negative : b&w; ; 4 x 5 in. 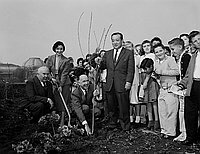 Planting cherry trees with school children at the Exposition Park Rose Garden at Exposition Park in Los Angeles, California, February 1958. 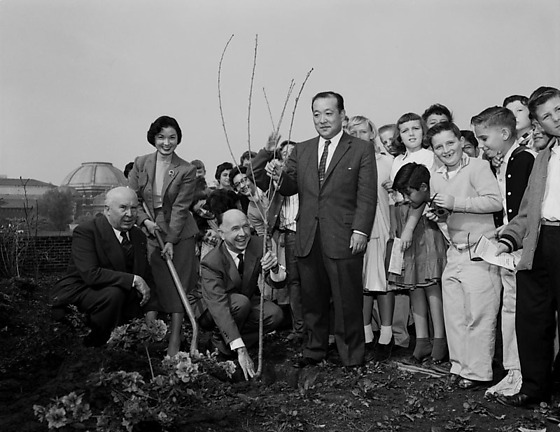 Japanese man in a suit, probably the Consul General of Japan, stands in center holding a branch of bare cherry tree as a laughing Caucasian man in a suit squats beside tree holding it upright. Japanese woman in a suit shovels dirt into hole. Another Caucasian man in a suit squats at far left. Group of Caucasian children stand at right on dirt in garden. Domed building in background, left. Typed on original negative envelope: Cherry Tree Planting at Rose Garden -- Exposition Park. All requests for permission to publish, reproduce, or quote from materials in this collection must be submitted to the Collections Management & Access Unit at the Japanese American National Museum (collections@janm.org).